I'm pretty curious about this one. I always wanted to read her adult series and never got around to it. Seeing a lot of this going around! It looks pretty interesting too! I have not read anything by her either. Very excited to start my copy of this though, it does sound really good. Great choice Christy! I really love the title for this book; that's what is keeping me interested as I'm not totally certain I'm interested in the plot. LOVED THIS BOOK!!! And I want to read it again! Kresley Cole writes great adult and she brings that talent to YA dystopian. You're going to love it! 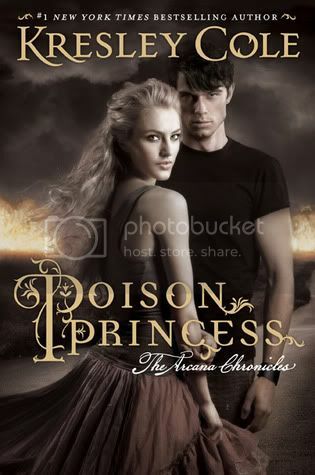 Poison Princess is pretty good. The love interest is dreamy, and he's got a Cajun accent. Plus, it's more Post-Apocalyptic than Dystopian--which I like. KC's a great author, but you never know how great authors will make the transition to YA. I'd say she did a great job. I'm looking forward to this one too! I'm trying to work out how the title ties in with the synopsis, it's really intriguing. Great pick :). This would be my first Cole book, too. Like you, I think it a good place to start. I'm loving the Louisiana setting and I really hope I get to read this one! I love the name Jackson, so bonus there! Gorgeous summary and an intriguing plot make this one an easy pick for my TBR pile though! I got this early but haven't gotten to it. It does look really good though. Nice choice.